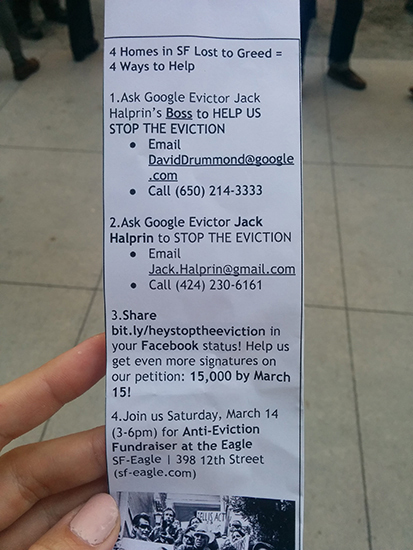 Tenants at 812 Guerrero, who have long been fighting their Ellis act evictions by their landlord and Google lawyer Jack Halprin, are protesting their eviction today by bringing a petition to Google to help stop their evictions. The two teachers and taxi driver who are tenants and organizers of the drive said they have gathered some 1,600 signatures and are outside Google’s offices on Spear Street in downtown San Francisco with about 40 other people. Though initially responsive, representatives from Google have told one tenant that there is little they can do to support her cause. Halprin purchased the building in 2012 for $1.4 million. After one tenant ousted by an owner-move-in eviction settled with Halprin out of court, the remaining tenants in the building were notified they would be evicted under the Ellis act in 2013. Those tenants were granted an extension on their original tenure in the building, which ends today. None have found a new home, but they expect an extensive filing and appeals process to draw the eviction out for another six months. Meanwhile, they have filed a lawsuit against Halprin for alleged neglect of the building and abuse of his landlord privileges. 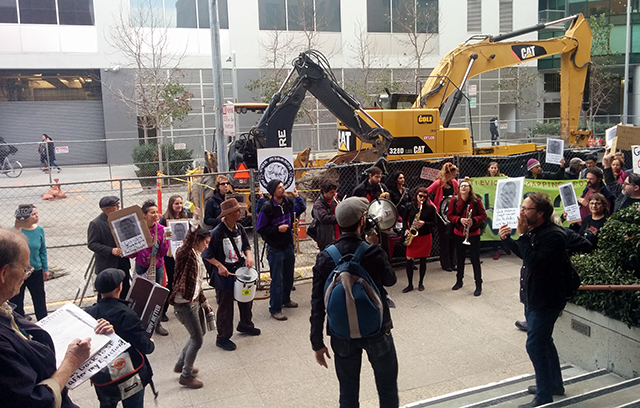 The 812 Guerrero tenants, along with housing rights advocates and Eviction Free San Francisco, are also asking that supporters contact Halprin and Scott Wiener, his supervisor. They will also host a fundraiser for their cause at the Eagle on Saturday, March 15 at 3 p.m.
5:23 p.m. About 40 people are outside, lots of media and police officers. They brought an orchestra, which is helping draw attention and keep things upbeat. Police don’t seem to mind. The people leaving the building are mostly ignoring the protesters. “Jack and I could’ve been friends, we could’ve been neighbors” says Claudia Tirado, one of the teachers who is being evicted. When Google employees leaving the building were asked what they thought, they said they couldn’t really talk about it. Protesters, however, had no trouble. “It’s time for Google and their millionaire lawyers to be good citizens, ” said Ken Tray, the political director of the United Educators of San Francisco. “You may say that you do not have the power to change his evil ways, but you do” said Evan Wolkenstein, a teacher at the Jewish Community High School of the Bay, who is also being evicted from his $1,700 a month one-bedroom apartment at 812 Guerrero. 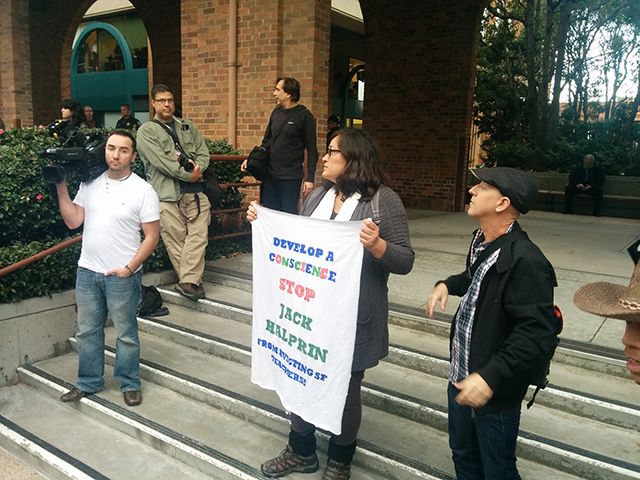 The protesters move into the inner courtyard, hoping to actually deliver their petition to Google. Johnny Sideris, a musician and tenant at 812 Guerrero, handed off the petition. Tirado, her son on her hip, tried teaching him on how to speak into the megaphone. “We’ll be back,” she promised. It’s time for the renters to be good citizens and realize it’s not their property and renting is temporary….. NOT FOREVER. It might help if people, including some protestors, didn’t use google+. It’s like being against Walmart but still spending your money there. Or driving other people to shop there. Otherwise, it’s like eating your cake and wanting it too. Best of luck to you all and blessings. This is all so evil and tragic and makes the stomach wretch because yeah… where to even GO??? I’m very sorry. Home is sacred. And this is all too real. Beyond metaphors and symbolism. Teachers, taxi drivers. Ugh. We’re all gonna be driving in hours to this city to serve, shop, drive, fix, clean at the heels of these… machine people. This is all worse than any cute sci fi story from the past. This guy bought a house to live in. When he saw what happens in San Francisco and had to pay off a tenant to LIVE IN HIS OWN PROPERTY he probably decided then and there that he didn’t want to be a landlord. I don’t blame him AT ALL. I keep the second unit in my building vacant and occasionally rent it on AirBNB or let visiting friends have it I would NEVER rent to anyone in San Francisco. Once you do, you can pretty much kiss your own property goodbye.